Hey it's time for more crackle polish! 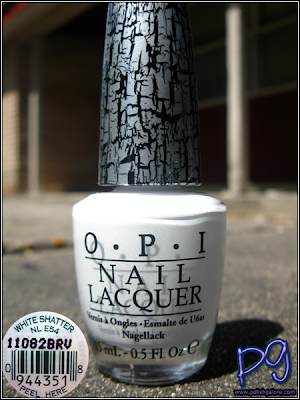 OPI White Shatter comes as part of the Serena Williams Glam Slam! Collection, currently partnered with Spark de Triomphe but I decided to check it out of my e.l.f. Black for a classic black and white look. This is one coat of Shatter followed by a top of Seche Vite. 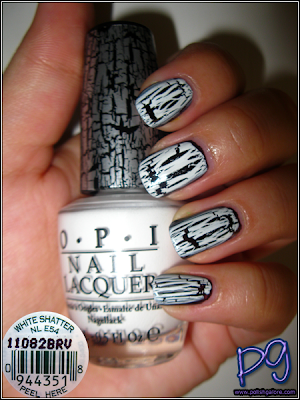 This crackled pretty well! I know a lot of people had issues with China Glaze Lightning Bolt not crackling "enough" and being rather stringy (I didn't really have that problem) but this is definitely a nice bold crackling polish and a very nice white I might add! I'm still on the search for a perfect one coat white creme - wish this was it! Not much to say in the shade - I'm still giggling how it tends to give a horizontal crack at the smile line (not on my pinkie though). I wonder if that has anything to do with body heat? Indoors with the flash - I'm in love with how clean this white is! my china glaze lightning bolt yellows over most polishes. i also had the problem with the stringiness, but this one looks gorgeous!